To celebrate your anniversary we carry 25th Anniversary Candles, Glass Card Boxes and Invitations! Our Glass Card Box for your 25th anniversary celebration makes a perfect gift for your guests to put a card in! Give your guests a personalized pen to take home to remember your anniversary party. Our personalized tapestry throws printed with their own picture makes a unique keepsake that the anniversary couple will treasure. 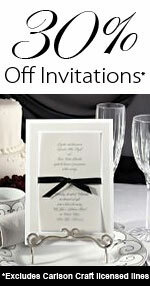 We also carry elegant 25th anniversary invitations!